What is the difference between Ales, Lagers and Hybrids? Okay…but what’s the difference between Ales and Lagers? Ales have been brewed for thousands of years, using specific warm-brew Ale yeasts, that float at the top of the brew. 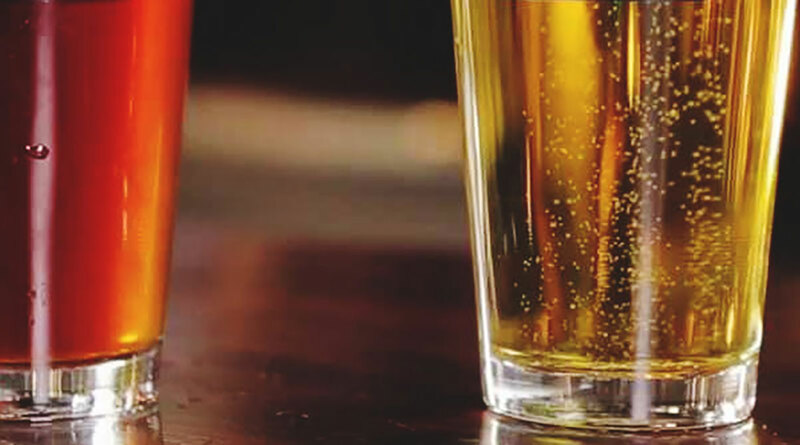 Lagers are a newer type of beer and requires lager yeasts strains which are brewed at a cooler temperature; unlike ale yeasts, the lager yeasts remains at the bottom of the brew throughout the fermentation process. Served cold, usually 40-45 degrees F, 4-7 degrees C.
Hybrid beer are of mixed parentage. These beers have been dubbed hybrids because brewers implement a hybrid method of fermenting those beer; for example they will use lager yeast fermented at ale (warm) temperatures, or they will ferment a beer with ale yeast but at lager (cool) temperatures. 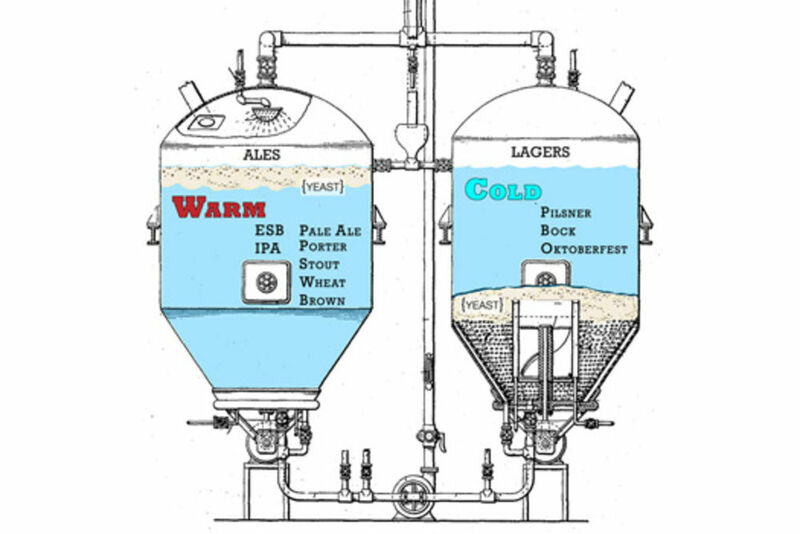 Lagers are relatively new to the brewing scene. A quick graphical reference for the differences between ale and lager. The main difference for the brewer is the brewing temperature: ales ferment under warm conditions; lagers cold. It possesses many similarities to that of ale yeast, Saccharomyces cerevisiae — it in fact has whole stretches that are identical to S. cerevisiae (as you’ll find out, there’s a reason for this). But lager yeast behaves in a profoundly different manner than ale yeast. The most obvious difference is that lager yeast works best in cold temperatures — temperatures that would make an ale yeast go dormant. Further, unlike ale yeast, no “wild-type” lager yeast has ever been found in Europe and lager yeast need humans to continue its propagation. Finally, ale yeast usually spends its life as a diploid organism. Lager yeast is what biologists call “allotetraploid”: it has four copies of its genome, which is made up of genomes from two different species. So, where the hell did lager yeast S. pastorianus come from? And why did it only show up in the 1500s, thousands of years after humans figured out how to brew with S. cerevisiae? The answer came in 2011, with the publication of “Microbe domestication and the identification of the wild genetic stock of lager-brewing yeast” by Libkind et al in Proceedings of the National Academies of Sciences. In it, the researchers analyzed 6 yeast genomes: S. pastorianus, S.cerevisiae, two contaminant Saccharomyces species found in breweries, S. bayanus and S. uvarum, and two wild strains. The scientists knew through prior research that Saccharomyces species thrive on oak trees in Europe. After collecting samples from forests all over the world, they isolated two cold-tolerant yeast strains from the forests of Patagonia in Argentina. After analyzing the genomes of these cold-tolerant strains, the researchers discovered that they were members of an entirely new species of Saccharomyces yeast, which they named Saccharomyces eubayanus. The “eubayanus” part is interesting, because what the scientists also determined in this study is that the contaminant strain S. bayanus found in the European brewing environment isn’t, as previously thought, actually its own species. It is a domesticated hybrid strain of this Patagonian yeast. The “eu” part of “eubayanus” is to indicate that the Patagonian strain is the pure progenitor species. Think of it as a Thunderdome of yeast taxonomy: Two species enter; one species leaves. Followup research, which I dug out of a Powerpoint presentation by the lead author from November 2012, indicates that many distinct strains of S. eubayanus exist in South America, which strengthens the argument that the strain is indigenous to the area. But what of lager yeast? Well, once the researchers compared the genomes of S. cerevisiae, S. eubayanus and S. pastorianus, it became clear that S. pastorianus — lager yeast — is a hybrid of S. cerevisiae and S. eubayanus. Basically, that lager yeast allotetraploidy I spoke of earlier? Two sets of lager yeast chromosomes are from ale yeast, and two are from this wild Patagonian species. The Patagonian species is what gives lager yeast its interesting cold-tolerant and sulfite-metabolizing characteristics–characteristics that manifest in the distinctive flavor and character of lager beer. Lager beer is fermented and then “lagered” (stored) in caves for a period of weeks or months at temperatures hovering in the 40s Fahrenheit. This low-and-slow fermentation means that lagers taste “clean” and lack the fruity esters characteristic of ales. Further, because of the sulfite metabolism, lager beers usually smell a lot like rotten eggs during fermentation (this is normal), and a very (VERY) slight bit of dimethylsulfide (DMS) character in the end beer is considered proper for the style. Ale yeast and yeast from the forests of Patagonia met in a brewery…and lager was born! To see this graphic in all of its glory, . So, where did lagers come from? Those who remember their history will already know the answer to why lagers have only been around for a few hundred years. Yes, the discovery of the New World and the establishment of trans-Atlantic trade happened at the same time. While nobody actually knows how S. eubayanus got to Europe — it could have hitched a ride on a fruit fly or a piece of wood — the researchers speculate that hitch a ride it did during the early years of trans-Atlantic trade, then eventually ended up in the cold-fermenting vats of Bavarian beers. There, S. eubayanus fused with S. cerevisiae to form a hybrid strain, which then evolved in the brewing environment by dropping some genes here and there — the cold and high-alcohol environment of a brewing vat made sure to kill off any unfit mutants — to the new brewing strain S. pastorianus: the modern lager yeast. Which then, via trade or early corporate espionage, traveled to breweries across continental Europe and beyond. And, like ale yeast, each time S. pastorianus arrived at a new brewery, it quickly adapted to its environment, forming the various lager strains available today. What about poor, demoted S. bayanus? Well, the researchers figured out that this strain actually arose when the newly minted S. pastorianus fused with European-endemic contaminant species S. uvarum in the same brewing vats. So, S. bayanus is a hybrid of a pure species and a hybrid of S. eubayanus and S. cerevisiae? Yes, this reads like some horrible unicellular soap opera, and that’s OK. Biology and brewing are both messy practices that frequently produce something entirely unexpected. In the case of all of those cold-tolerant S. eubayanus strains being isolated in Patagonia, who know? Maybe with some tweaking so they can tolerate the products of fermentation, they’ll eventually produce an entirely new kind of lager yeast. Sometimes a bottle of your favourite beer that gets pushed to the back of the pantry and forgotten. It’s sad, but it happens. If you’re thinking “Can I drink old beer?” “Does beer expire?” “What is a skunky beer?”, keep on reading to find out all you need to know about beer gone bad!